A quick tutorial for setting up a Mac keyboard to work in Linux with the proper key maps. I’ve mentioned it before, but I used to be a Mac OS X user for about 10 years. When I switched over to Linux, I did so on my Apple hardware. There are a few things that I just could not get used to when it came to configuration. One of those things was, the ‘ctrl’ key. It was so ingrained in my brain to use ‘Command+C’ to copy, not control+c. Well, Gnome’s configuration settings came to the rescue. You can map the Command key to act as your Control key vary easily. First open up your Menu and get to the Control Center. Once open, you are looking for your Keyboard Preferences, of which we want the ‘Layouts’ tab. 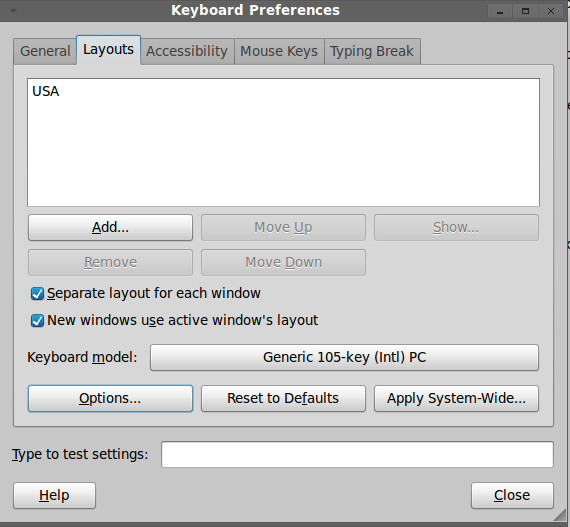 Select the ‘Options’ button, and you’ll be presented with a dialog of many items to customize your keyboard layout. Click on the ‘Alt/Win key behavior’ item so it expands. Choose ‘Control is mapped to Win keys (and the usual Ctrl keys). Close out those two windows and it’s magic! You can now use your Mac Keyboard like it’s a Mac. No more missed copy/paste moments. …back to google it is! Sorry you’ve having a problem. As this site has migrated over to it’s current iteration, it’s lost it’s ‘information section’. It used to have a preface that I was using Ubuntu…sorry about that! Thanks for your helpfulness it worked well for me after a 20min google search brought me to your post. PS! @kip …. you’re an ungrateful prick! Apologies @Chris … but i cant stand people like him. Awesome! Thanks Theo! Also, it takes all kinds man. I appreciate the support, but I get where the last comment was coming from 😛 Just take things in stride. I’d be curious, if you’re able to let me know what were you searching for that wasn’t providing my page? I’d love to help people solve this if I can make it easier to find in search. Any chance you’ve tried to figure out how to map the -Apple- launchpad key to the Applications overview? That’s one I’m researching right now, with no success.